Asia-Pacific leaders failed Sunday to bridge gaping divisions over trade at a summit dominated by a war of words between the US and China as they vie for regional influence. For the first time, APEC leaders were unable to agree on a formal written declaration amid sharp differences between the world's top two economies over the rules of global trade. "You know the two big giants in the room. What can I say?" said host and Papua New Guinea Prime Minister Peter O'Neill, conceding defeat. Canada's Prime Minister Justin Trudeau admitted the failure came down to "different visions on particular elements with regard to trade that prevented full consensus." 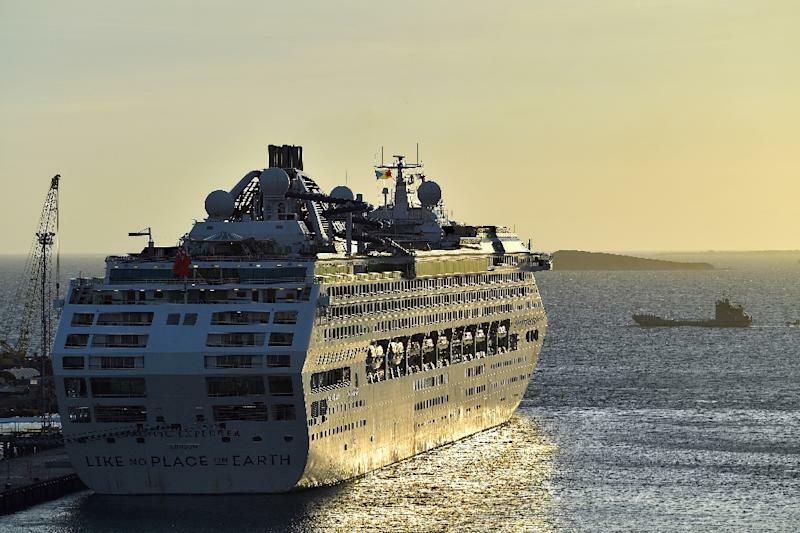 Sources said going into the meeting the United States had pressed for the leaders to issue what amounted to a denunciation of the World Trade Organization and a call for its wholesale reform. That demand was a step too far for Beijing, which would likely get less preferential treatment under any changes. O'Neill indicated the WTO had been a sticking point in agreeing a joint communique. "APEC has got no charter over the World Trade Organization. That is a fact," he said. "Those matters can be raised at the World Trade Organization." The spat ramps up the stakes for a crunch meeting between presidents Donald Trump and Xi Jinping at a G20 summit in Argentina at the end of the month. O'Neill denied it was a humiliation for his poverty-hit country, which was hosting the annual gathering of the 21 nations for the first time. 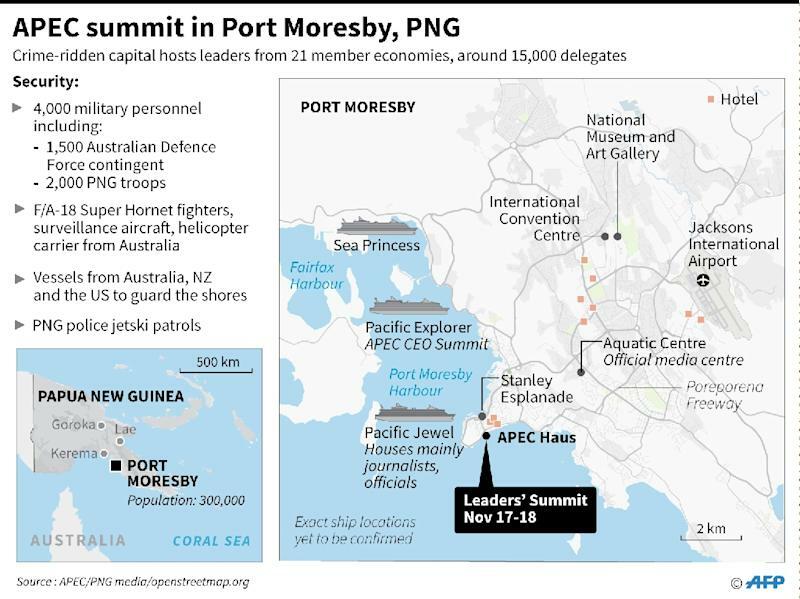 As tensions boiled over, police were called when Chinese officials attempted to "barge" into the office of PNG's foreign minister in an eleventh-hour bid to influence a summit draft communique, three sources with knowledge of the situation told AFP. Chinese foreign ministry official Zhang Xiaolong denied the incident, telling reporters: "It's not true. It's simply not true". Even before the summit started, tensions between the two big hitters came to the fore with Xi and US Vice President Mike Pence crossing swords in competing major policy speeches. In a speech to business leaders just minutes before Pence, Xi insisted the initiative was not a "trap" and there was no "hidden agenda" -- amid criticism that it amounts to chequebook diplomacy in the region. Pence told reporters Sunday: "I spoke to President Xi twice during the course of this conference. We had a candid conversation." He told him the US is interested in a better relationship with China "but there has to be change" in Beijing's trade policies. "Business leaders do not want to speak out, but behind the scenes here, they are talking over dinner saying 'how has this happened'?" Denis O'Brien, the billionaire chairman of Digicel told AFP. "It's a very forced situation, one country is trying to force all the other countries to change tariffs agreed over years," O'Brien said. Trump -- and Russian President Vladimir Putin -- both decided to skip the gathering, leaving the spotlight on Xi who arrived two days early to open a Chinese-funded school and road in Papua New Guinea's dirt-poor capital Port Moresby. 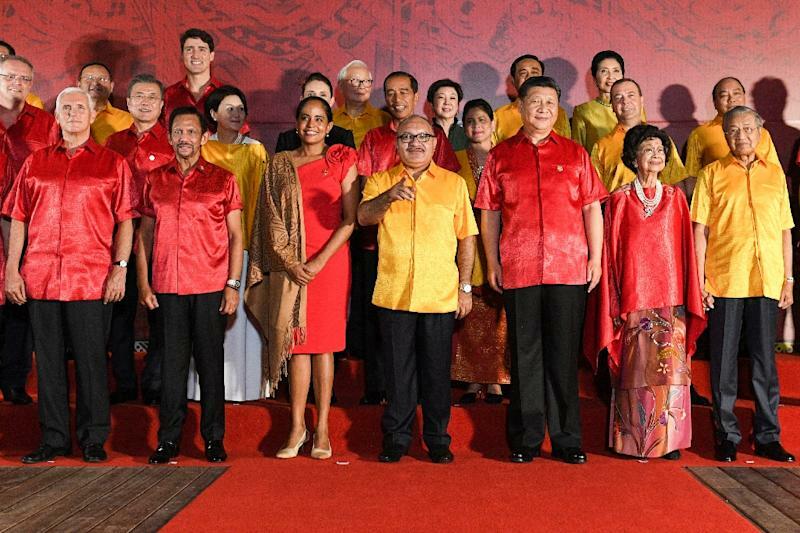 Xi has been the star of the show, front and centre at official photos whereas Pence, by choice and because he carries a lower rank of protocol, has kept a lower profile, only deciding at the last minute to stay overnight in Port Moresby -- shelving original plans to fly in and out from Cairns in Australia. And as the US and China tussle for influence in the region, the statement dangled the prospect of similar projects for countries that "support principles and values which help maintain and promote a free, open, prosperous and rules-based region."